The small funnels are similar to our glass adapters, they hold approx. 50-60 g of coffee depending on the adapter model. Although the smaller ECM and Profitec grinders with ø 54 mm burrs are less expensive than the professional models with ø 64 mm burrs, there are many requests concerning our TORR TOYS Glass Hoppers for these semi professional grinder models offered by the ECM family. The solution for those grinders is very easy, we only have to cut 8 mm at the lower end of the original ECM adapter to get the perfect adapter for the smaller grinder models. We will add the models to the shop soon, prices will be the same like the standard ECM 64. We are always busy to develop, modify and improve our TORR TOYS items. Furthermore, we always try to be helpful with multiple, complex answers to your questions to enable the best choice when you are going to decide about new coffee related products. Last but not least there are many efforts and extra miles to go to inform you at the NEWS pages to keep you up-to-date. If you are happy with our work, we have the chance now to get minimal donations via XRP TIPBOT - see info below. If you are not satisfied, please let us know, we will try hard to improve in the best possible way. Please be aware that we are a small team which can´t be compared to the BIG PLAYERS. We are busy to adapt the products, our websites and service now to bring it to the next level. We hope you will enjoy this. The XRP TipBot is an application you can download to your mobile device. It allows you to send or receive tips in the form of 'XRP', a crypto-currency that is used by banks and financial institutions. XRP is one of the most popular cryptocurrencies on the planet. You can think of it like 'digital money' that is good anywhere - no matter which country you're in. It can be transferred to others in under four seconds; banks and other financial institutions use it for quickly transferring money around the world. 1. Download the XRP TipBot App from the Apple App Store or Google Play store. 2. Open the app, tap Scan the QR at the bottom of this page or at the TORR TOYS contact page. 3. Now you can show your donation QR to other XRP TipBot users. The campaign is expected to run until end of April, maybe until Mid May to enable the first big batch of hoppers for the Eureka MIGNON ind the beginning of September. We are happy to let you know that we received a big batch of glass adapters finally and all “Made in Germany”. These new adapters are better concerning the all-over quality; however, we can also find little modifications here like the smaller gap and a modified fastening of the slider to avoid uncontrolled movement and vibrations. The already modified adapters are the Bestsellers: MK, Mazzer S1, ECM, Quamar and Rocket. Very busy days now to make some customers happy. We overworked the design of the Filling Funnel and also changed the design a little bit. Furthermore, we modified and optimised the details to get that handling and usability. In addition to that, the standard funnels are made from aluminium right now, either glossy polished or anodised matte black. The stainless steel version can be made on demand. The funnel is made to hold approx. 100g of coffee beans. The most significant improvement is the smaller gap to prevent beans from getting stuck as we made the gap just a little wider than the slider itself. Furthermore, the gap itself got another geometry and design to allow a movement without wobbling. These modifications can also be found with the MK glass adapters now. As Ceado modified most of the E37 grinder 2019 models we also had to change the glass adapter here to allow a perfect fit. With the new CEA adapter ø 56/58/23 mm it is possible to use the glass hopper for the remaining “Rubber Chute” like E37J and also for the E37S with Quick Set Gear. There is no more chance to use the MAZ S1 adapter for the new E37S 2019 models. The Ceado rubber chute is only used for the ø 64mm flat burr Ceados and for the E37S / 2018 models. In addition to that we can add now the magnet for the E37K (conic model) at the outer part of the glass to keep the security switch in a perfect working condition. The E37K looks fine with a 300, 600 and 1300 glass hopper which uses the same body like the Ceado E37 Titanium. We will add the new Ceado adapters to the shop these days. They will be available in the beginning of March. All new Ceado grinders will be delivered as 2019 model. Unfortunately, we had to adapt the prices here for the new models due to the Ceado guideline. Although there is a trend to use small hoppers even with big grinders, we notice that our customers order bigger Glass Hoppers like the 1300 model and also ask for more significant options to be used for coffee shops and high volume bars where it´s a standard to use some KGs of coffee per day. The Mahlkoenig K30 and the big Mazzer grinders like Kony, Major and Robur are real workhorses and look really beautiful with big and colorful TORR TOYS Glass Hoppers. However, there are more big grinders which can be used with a 1300 hopper. As you might know, we can provide hoppers for most of the professional and semi-professional grinders in the market, and the range is still growing. 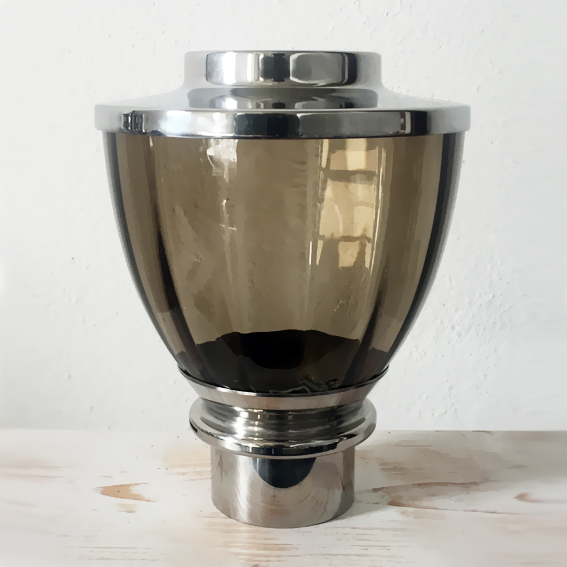 So it doesn´t matter if you are running a big Eureka Olympus, Fiorenzato F71 or a famous Macap MD7, you can be sure that we will have the right adapter for your grinder to offer the option to use one of our luxury and useful Glass Hoppers made from handblown glass in small batches. There are 3 new Ceado grinders available now, they are launched at the Sigep Fair from 19-23 of January in Rimini. One of them is a Single Dosing Grinder, the others are modified grind on demand grinders with ø 64mm and ø 83 mm flat burrs. More details about the new grinders soon, as well the prices and possibility to order via Shop. With the broader programme of the Ceado grinders, we will also launch individual Glass Hoppers for the Ceado. The Ceado can be used with the Mazzer S1 adapter or with the special Ceado CEA adapter. We would like to throw back to see what we have done in the field of glass hoppers in 2018 but we will also introduce the new and upcoming items for 2019. We are happy to announce that there are 20 different glass adapter/grinder options + 1x Funnel available now. With this impressive wide range, most of the serious grinders in the market are covered. There is some more in the pipe of course. But his will take some time for sure until S/S 2019. If you miss the right adapter and connection for your grinder, for sure we might have it but sometimes the grinders uses the adapters and parts of other brands or they are made by one of the big grinder companies. e.g. Elektra Nino = Macap 2. It´s always the best solution to drop a mail, we will be able to help for sure. Good News! The biggest Mazzer grinder, the Kold can be used with the Robur S3 TORR TOYS glass adapter - it´s really the same thing under this stylish plastic box. If you have a Mazzer Kold…Yes, we can! We need to inform you that the launch of the TORR TOYS Glass Hoppers for the new Mahlkoenig E65S / Anfim Pratika and the Eureka Mignon (old and new model) need to be delayed to early 2019. Stay tuned….we will update you shortly about any progress or earlier options. Copper for the Hopper is always nice, and we are having the chance of different surfaces from a natural patina finish to a high-gloss polished & painted one. As the reddish metal parts are quite famous already with some types of Espresso machines like Elektra Lever, Victoria Arduino and Bosco we will also go for copper adapters. However, a copper lid can also be paired with a black or stainless steel adapter. We are busy to make some tests to reach out a hammered copper version, but this will take some time for sure. Please enjoy the pure copper so far. We have made an update of the Grinder Compatibility List Autumn 2018 - Download. With this list, you can find the glass adapter you need for your grinder, also for similar grinders or grinder brands used by coffee machine brands. 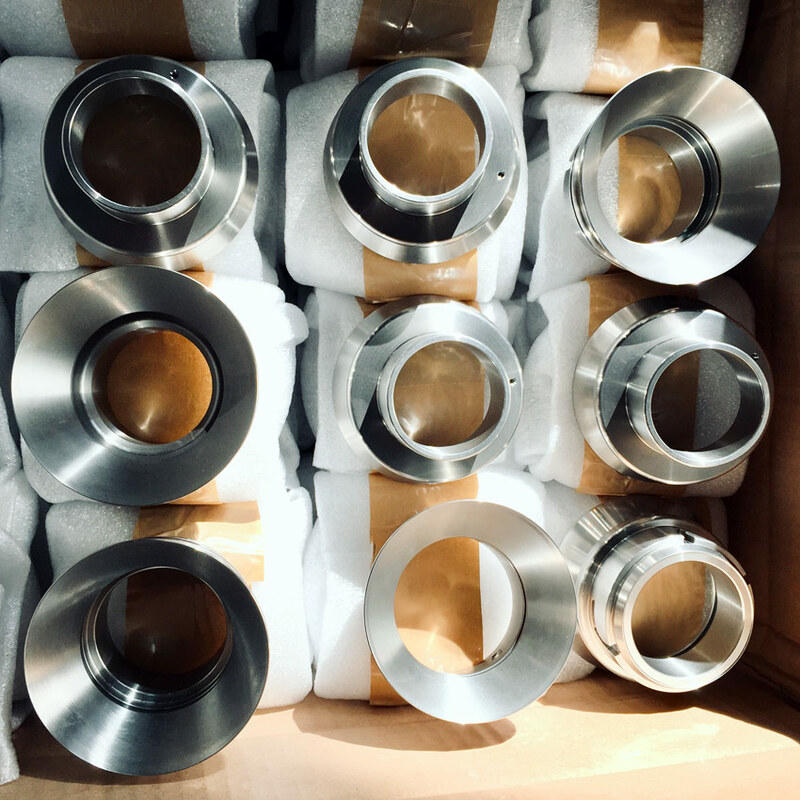 If you can´t find your grinder in that list, just drop us a mail to check if we have the right adapter or if we can produce it. With the increasing number of Versalab M3 grinders with its great dosing tool for SINGLE DOSING we are also able to provide special adapters "VERS3" and glass hoppers now. It´s also possible to use the standard Mahlkoenig MK adapter which uses the same inner diameter ( approx. ø 50 mm) but it´s more expensive and of course, the MK uses the outer bayonet you don´t need for the Versalab grinders. The better choice indeed is this special made Versalab adapter. Useful and recommended glass for the Versalab is 250/300/450 and 600 size. This is a new colour from the darker range, it´s dark violet black, which is not only very beautiful, this colour also provides the best protection against light to keep the coffee fresh. The outer impression of this glass is nearly black with a hint of violet when you have some counter light available. If you open the lid you can see that beautiful dark violet for sure, especially at the thinner parts where you can find the bullseye bubbles. This picture shows that dark violet glass combined with a set of matte DLC (Diamond-Like-Carbon) coated metal parts which are a good match indeed. We recommend this colour also for Coffee Shops, Bars, kitchens or any locations where the grinders are exposed to bright sunlight. As we like this colour very much, we are going to make more tests soon here with different patterns and designs. 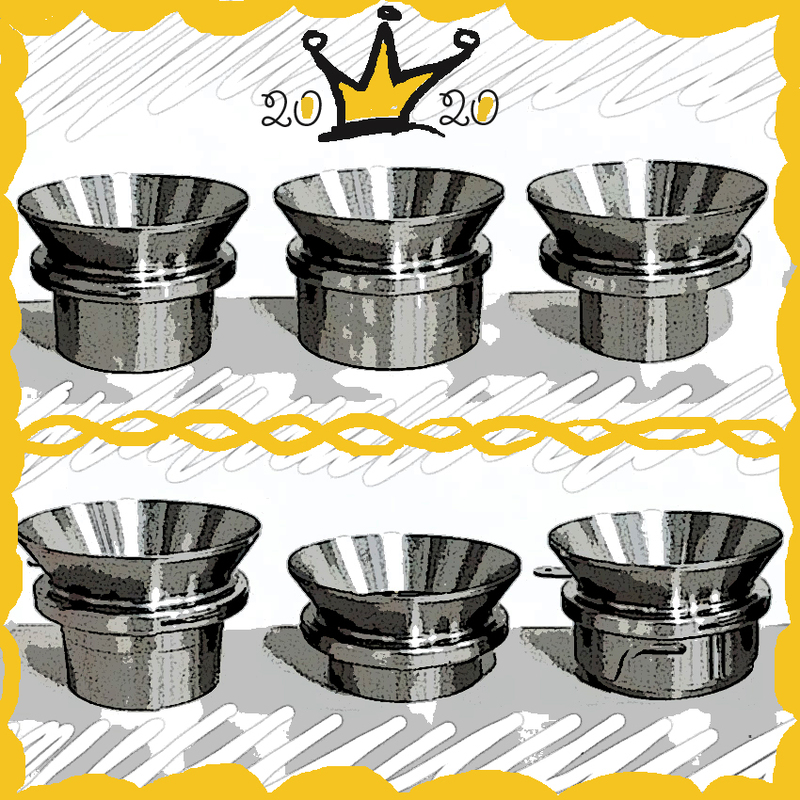 With finding more and more high-end grinders and premium burrs in the market we also notice a higher demand for special glass hoppers, unique pieces and Art Glass as there is no need for an upgrade concerning the quality of the coffee and most of the grinder designs are timeless at all or even old-fashioned like many big Mazzers or the famous EK43 made by Mahlkoenig. Another good example of a special Art Piece is this Amber 600 hopper that comes with glossy DLC metal parts and a spiral + bubbles design. The problem of the unique pieces is to meet the exact requirements of the customer e.g. the right colour, the right design or a special pattern. Doing those Art pieces also means that we usually have to make more pieces to test and to be sure as you can only judge after having finished the glass in the cold workshop. As for this, it´s really important to discuss the wishes in detail before the final order is made. I guess it´s also clear that we can´t exchange Art Pieces which are made on demand and that those pieces need a much longer delivery time than the standards. For the future, we will try to produce and keep some specials and limited editions in stock but of course, you will never know.